Tim and Jeannene O’Neil and their daughters, Julia, left, and Katie, at the 2012 Army Ten-Miler race. Two Illinois State Army ROTC alums are helping a team of today’s cadets make the trek to Washington, D.C., this weekend for the big Army Ten-Miler race—including their own cadet daughter. Tim and Jeannene (Cooper) O’Neil, both 1985 graduates, now live outside D.C. in Maryland, but their daughter, Katie, attends Illinois State. The junior business administration major is leading a team of seven cadets to D.C. for Sunday’s Ten-Miler, one of the largest 10-mile races in the world with 35,000 military and civilian runners who are raising money for the Army’s Morale, Welfare and Recreation fund. Katie helped lead ROTC fundraising efforts to pay for gas and race fees, but it was her parents who stepped up again this year to give all the cadets a place to stay Friday, Saturday, and Sunday night. It’s one of the many benefits, Katie says, of having two supportive parents who went through the ROTC program themselves—albeit 30 years ago—and still remember what it’s like to put yourself through college. 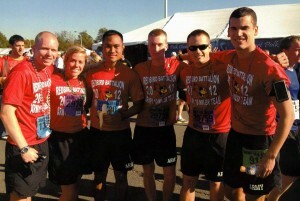 The six Redbird Battalion cadets who were on the 2012 Army Ten-Miler team, including Katie O’Neil, second from left. The Ten-Miler, now in its 29th year, is a bit of an O’Neil family tradition. Katie and some other cadets made the trip last year too, and were joined in the race by Tim and Jeannene, plus Katie’s sister Julia, an ROTC graduate from University of Dayton who is currently serving in the Army in Germany. But the ROTC team’s trip isn’t cheap, and neither are the race fees ($65). Free lodging is a big help for the cadets, who have to try out to make the team and then fundraise to pay for it. They start driving to D.C. at 6 a.m. Friday. “We’ll save them some money, and we’ll have some hot pizzas ready when they roll into town,” said Tim. Tim and Jeannene met while they were both in the ROTC program. Tim, a business administration grad turned pilot turned public affairs officer, served in the Army for 35 years in total (26 years active-duty) before ending his service this year, his last role helping the Army navigate the use of its Reservists. Jeannene, who studied speech communication, put in eight years of service (five active-duty). But just like her mother and sister, who joined ROTC to pay for college, Katie says the tuition waiver and other financial aid she earns through her service were major selling points. She joined ROTC and contracted her freshman year, and will serve at least eight years in the Army after graduating in May 2015. For Tim and Jeannene, Katie’s choice offers them a chance to revisit their old program, now with more cadets than when they were on campus. It also gives them an opportunity to connect with other alums in the program, like the Illinois National Guard officer Tim ran into at last year’s end-of-year commissioning ceremony. “It’s kind of neat that Katie decided to go there,” Tim said. Come this weekend, Katie’s two families will be together again under one roof. Her sister Julia will be back from Germany for the Ten-Miler again. Her younger brother, Andrew, is still in high school. “Just having a house full of people makes it bustling and exciting again,” Tim said.